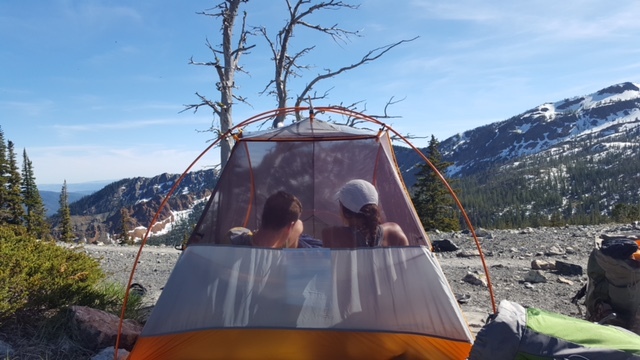 While Summer officially kicks off this week, my summer kick-off happened the first weekend of June with a one night backpacking trip up to Navaho Pass. The weekend had been blocked for months to tackle an overnighter as prep for the Enchantments. But as the weekend loomed near, the early summer heat still hadn’t melted the snow dumped on the mountains this winter. There’s nothing more frustrating than blowing your fan at high speed and researching AC units, while finding all Washington trails are still buried beneath stubborn snow. After a rabbit hole of research on trip reports and old backpacking articles from past years with harsh winters, we finally found a trail: Navaho Pass, a 11 mile out and back trail near Cle Elum. Packs were heavy, and the heat was blazing in the mid-90s, but we took in the fresh pine smell and hiked in to find a spot for the night. We ended up passing over the usual camp grounds and settling in on the ridge. And while the sun kept beating down, we used each other for shade and dug out a snow pit to cool our beers. Once the sun set, we cooked our REI meals, enjoyed the warm summer night and saw some spectacular stars. The next morning, we made a run for the summit. And while the hike was less than a mile, it was one of the steepest trails I’d done — and much more fun on the way down when we could slide down old snow banks. We made it off the mountain and off to the Brick in Roslyn for post hike beers and burgers — all ready to tackle a summer of more peaks and adventures. Jori, you are my “take me away, Calgon” moment and I thank you. Beautiful.